Styles seem to go in a cycle, and many things that were popular in the 80’s are popular again. Here is a look back to an awesome decade. 1980 was 36 years ago, can you believe it? I was born in February of 1980, so I experienced 1980 in its entirety minus that one month. 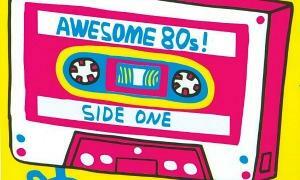 Of course, I wasn’t really cognizant until 1983 or so, but I still feel like I experienced the best of the 80’s. Let’s take a trip down memory lane with DealDash! The 80’s were a great time to be a kid! If you like electronics and video games, the personal computer became more affordable in the 1980’s, so many more families were able to afford one in their homes. The Atari came out in the 70’s, but the Atari 2600 was still the video game system to have in the early 80’s, but in 1985 the video gaming world was changed forever when the Nintendo Entertainment System (NES) was released. Science grew by leaps and bounds in the 1980’s, and amazingly, the first surrogate pregnancy took place on April 13, 1986. Other notable medical advances in the 1980’s include the first permanent artificial heart in 1982, the MRI machine was invented in 1985, and the kidney dialysis machine was also invented in 1985. When you ask someone to think about the 1980’s many people mention the fashion and the music. Since fashion and music go hand-in-hand, let’s tackle that one as a combination. MTV was launched on August 1st, 1981 and some of the most popular musicians were Madonna, Duran Duran, Michael Jackson, David Bowie, Billy Joel, and so many more. Fashion-wise, teens and young adults wanted to dress like these bands, and there were ripped jeans, crazy-colored hair, and multiple piercings. See what I mean about styles going in a cycle? Many amazing movies came out in the 1980’s that are still watched and moved today, such as E.T. (the first movie that I saw in the theater), Rain Man, Driving Miss Daisy, Batman, Return of the Jedi, The Breakfast Club, Nightmare on Elm Street, Terminator, Predator, Friday the 13th, and thousands more. Surprisingly, cable TV was invented in the 1940’s, but it really gained popularity in the 1980’s. This was mostly attributed to specialty channels such as The Disney Channel, HBO, and MTV. Many TV shows that started in the 1980’s are still popular due to syndication today, such as Seinfeld, Growing Pains, 3’s Company, Who’s the Boss?, Full House, and too many more to list here. I hope that you found this trip down memory lane with DealDash interesting. As I said before, many of the things that were popular in the 1980’s are still popular today. If you’re interested in getting a computer, video game system, or even a turntable, be sure to check DealDash. DealDash often has these items up for bid. Visit DealDash now. Good luck and happy bidding everyone! This entry was posted in Uncategorized and tagged 1980s, atari, computers, Deal Dash, DealDash, DealDash Auction, dealdash auctions, dealdash.com, electronics, kids, nintendo, video games on December 4, 2016 by . I grew up in the 80s and 90s, and have a very soft spot in my heart for retro video games. Here is a quick overview of some of the most popular game systems. Atari 2600 – The Atari 2600 was originally called the Atari VCS (Video Computer System) and was released on September 11, 1977. Later on, in 1982 it was re-named the 2600. This was the video game system that was around my house when I was a baby and small child. I have fond memories of playing Pole Position and Pac-Man with my dad on our Atari 2600. The Atari 2600 was discontinued in January of 1992, which is amazing to me that it was still being sold until then, seeing as how the NES (Nintendo Entertainment System) was released in the US in 1985. You would think that the Atari 2600 would have been completely obsolete when the NES took the shelves. NES – The NES was released in the US on October 18, 1985, and I became the proud owner of one on Christmas of 1986. Six year old me was ecstatic, as I had already played on a friend’s NES and become a huge fan of Mario. Super Mario Brothers, Super Mario 2, and Super Mario 3 will always be my favorite video games. There were other great games released for the NES such as Legend of Zelda and Contra. The NES had a great 10 year run, however on August 14, 1995, Nintendo discontinued the Nintendo Entertainment System in both North America and Europe. Sega Genesis – The Genesis was released in the US in 1989, and had some very popular titles such as Sonic the Hedgehog and the Mortal Kombat franchise. The Genesis was discontinued in 1997. Super Nintendo – We have come to my favorite game console of all time, the Super Nintendo! The SNES (Super Nintendo Entertainment System) was released in 1992 in the US, and I am happy to say that I was able to convince my parents to get me one immediately. The SNES has some amazing games that are still really fun to play even though it’s been 24 years since the SNES came out, such as Super Mario World (my favorite game of all time), Sim City, and Donkey Kong Country, and Super Mario Kart. Sadly, the SNES was discontinued in the US in 1999. There you have it, an overview of the “grandfathers” of today’s game consoles such as the Wii U, Xbox ONE, and Playstation 4 consoles. I hope that you enjoyed reading about the game consoles of the 80s and 90s. If you’re interested in picking up a modern console or video game be sure to check out DealDash! They frequently auction off game consoles, games, accessories, and game gift cards. Check out the Electronics and Computers category at this link right here and see how much you can save! Good luck and happy bidding everyone! This entry was posted in Uncategorized and tagged computers, Deal Dash, DealDash, DealDash Auction, dealdash auctions, dealdash.com, electronics, games, nintendo, one, playstation, video games, xbox on June 9, 2016 by .